Tray (also Spray/Tray): This is our most versatile and rugged deaerator unit. It is offered in a range of 3,500 #/hr to 2,000,000 #/hr and higher. This unit can handle severe load swings, varying inlet water temperatures and changing operating pressures while maintaining deaeration efficiency. 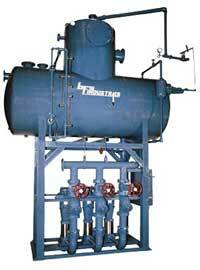 It is typically priced higher than the other types of deaerators in a given size range. 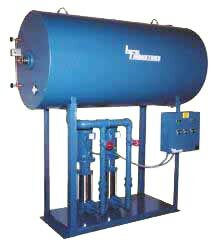 BFS Industries has a full line of standard boiler feed and condensate systems with elevated receivers. These are equipped with heavy gauge carbon steel tanks in standard capacities from 30 gallons to 2000 gallons. Pumps are available in centrifugal or regenerative turbine types and vertical or horizontal configurations to fit your application. ZER-O-PAC surge/transfer systems are available in eighteen standard sizes ranging from 3,500 #/hr to 150,000 #/hr, with an unlimited selection of non-standard sizes and options.